This article is a brief introduction to FOBOTs. The purpose of a FOBOT is simply to terminate, patch, and organise incoming and outgoing fibre. Have a look at the picture below. It is a top view of a fully terminated fibre tray. The incoming fibre (for this example we will say a 12 core fibre) comes into the tray from the rack at point A. The outer sheath of the fibre cable is removed and the glass cores are exposed. 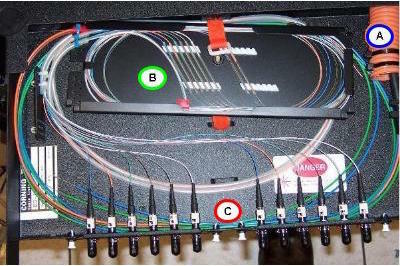 These are spliced* at point B to pigtails** which have a pre-terminated connector on the end. The pigtails (with the pre-terminated connector) are plugged directly into the through adaptor*** at point C. This means the fibre cores from the incoming cable are easily identified, organised, and can be patched out to other devices. If you don’t recognise or understand some of these terms, there are some definitions at the bottom of the page. By this point, most branches would have done a FOBOT sale; it is quite common and a simple device compared to most of the electrical equipment you guys know inside and out. Think of it like a GPO. The bare cores of the electrical cable cannot be connected directly to your toaster, TV, or lamp, but rather the electrical cable is terminated to a wall plug (GPO) which is ready for a device to be plug in or out of it. FOBOTs are just that - a point where the incoming fibre cable is terminated to a standard fibre optic connector so it can be patched to a device.